With June in full force, I’m all about bringing balance to my closet. Think: travel-ready styles that are modern and versatile anywhere you go! Summer also means simplicity in my book so today we’re talking about this all-blue look that’s perfect for any destination. Now all you need is a plane ticket! I’m obsessed with this sleeveless sweater and its cute fringe hem. I added my go-to crop pant style in navy and a lightweight polka dot blazer. Since I’m petite, (thank you Ann Taylor for this thoughtful option – they also offer tall sizes! ), this monochromatic makes me look tall and slender. And these pieces can be worn anywhere you go! To complete this look, I added a straw fedora hat (which will be perfect for my upcoming trip to the Amazon rainforest!) and a designer bag. My sandals (similar pair here) are simple yet chic. Wait, but what about that blazer? Let me geo check this navy (geo check) blazer. 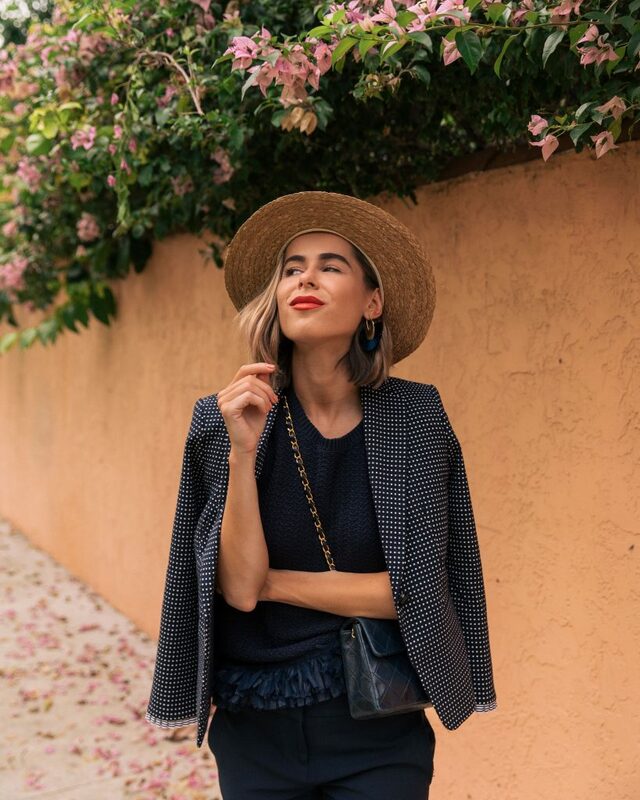 Even though this look is ready-to-go sans the blazer, there’s nothing wrong with adding a lightweight jacket into the mix in case your destination cools down at night. (Next month we’re going back to Mexico to celebrate my birthday! It cools down at night so I definitely plan on bringing this blazer with me to outdoor dinners!) The 3/4 sleeves allow for great flexibility and the color meshes well with tan tones, pinks and creams. Check, check! Ann Taylor gives women of all ages endless options and versatility – for big days, work days and everyday. Whether you’re feeling savvy and sophisticated or need a look that’s perfect for summer travel… the unique balance is always found here. Which is why it continues to be one of my favorite (affordable) shops! And with that said, I’m off to Brazil later this week! Ciao, ciao! Love everything about this look! You can dress it up or down with the blazer. I think the shoes are my favorite though.